The signage industry is quickly changing, and LED signs (also known as Electronic Message Centres or Digital Signage) are quickly becoming the choice of many businesses for the ability to attract customers to your business with relative ease. Once you have made the decision that an LED sign is the best option for your business, the next step is to choose a sign company to partner with, and this is where we come in. The recent popularity of digital signs have bombarded the market with manufacturers and suppliers, of varying levels of quality and reliability, and the decision making process on who to partner with can be extremely intimidating to a first-time purchaser. We have done the research, and in-house testing, and these digital signs pass and exceed our strict standards on quality and reliability. All suppliers are established companies that will be around to support the display for the full life of the sign. Our staff have been factory trained on proper install and service & repair practices so we can support your signage as a One-Stop-Shop. Not only are Daktronics one of the largest EMC suppliers in the world, but they are also the trusted choice of the NFL, NHL and other sports divisions to design, engineer, produce and install the largest LED displays in the world. We are proud to partner with Daktronics because of their superb customer service (before, during and after the sale), their dedication to quality products, and straightforward control software. Our Installation & Service crews are factory trained by Daktronics engineers to not only install, but also to service & repair their products. Our sales team have attended the annual Sales Expo in Brookings, South Dakota (Daktronics Headquarters) to learn about the latest products and innovation straight from the source. A Demo trailer is available for any customers that need a more “hands-on” experience with their future technology. Contact Us to arrange a demo! Blanchett Neon was the top supplier of Daktronics Electronic Displays in Canada in 2012. After making the investment in a new LED sign for your business, you want to be able to use it immediately, and not worry about learning a new program for which the manual may or not be available, or even in English! For every LED sign we sell, included is comprehensive one-on-one software training from the supplier themselves. All training will be customized for your individual needs and experience, and will allow you to have messages created and ready to go so when the sign is installed, your new Digital Sign can begin advertising for your business immediately. Proper content-creation techniques will be taught, from choice of fonts, to attention-grabbing wording. Get started with our 10 Commandments of Effective Outdoor Advertising. Ready-made content is available for purchase to help get started. Our talented Senior Graphic Designer drew the example on the left. Our award-winning design department will design a complete signage package that will draw attention to your LED sign while building brand recognition. It is most effective to have your sign branded firmly as your business, so your digital sign can focus on advertising what you do, instead of displaying your business name. 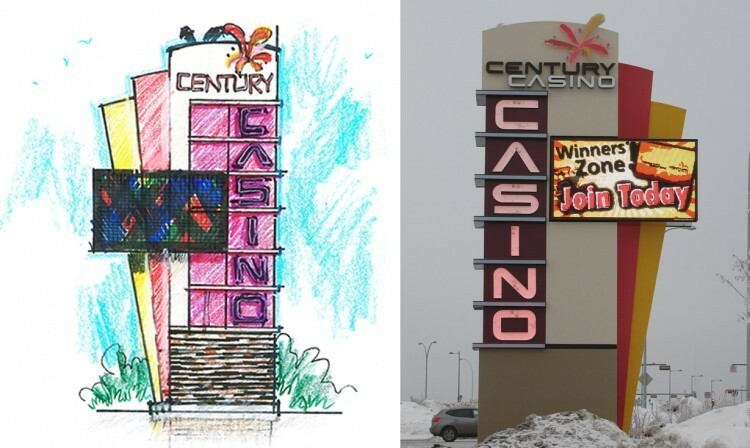 Creative Design Components will compliment your building and draw attention to the sign. Check out other creative Digital Sign designs in our Portfolio. From working with Norquest College to have the permit decision changed from denied to approved for their new LED displays in downtown Edmonton, to working with Alberta Transportation on digital signage regulations to helping the City of Edmonton to write one of the most progressive Digital Signage Bylaws in North America, our team is unmatched in experience when it comes to permitting electronic signs. The very first step we take when you contact us is to research your municipalities unique LED signage bylaw; no two are the same, and some have specific restrictions that will directly affect the design such as hold-times, colour capability (ex. red/ mono only), and size. Once you have decided to move forward with your electronic sign, leave the permits to us! From completing the appropriate paperwork correctly to attending SDAB (Sub-Development Appeal Board) meetings if the original permit is denied, to working with municipal officials on re-working signage bylaws, we will make every possible effort to have your signage permit approved. 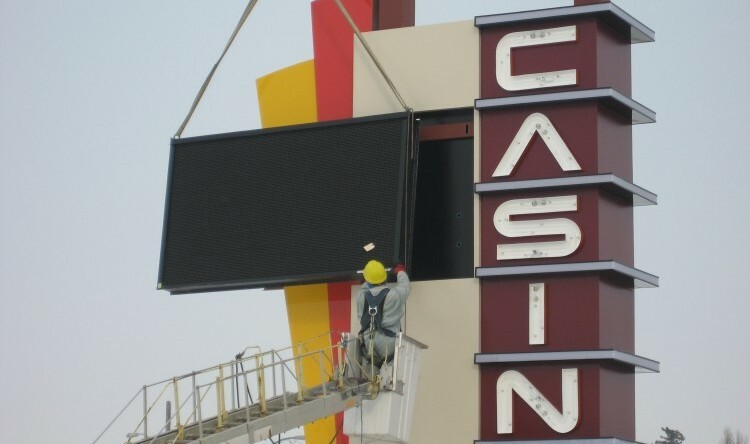 Our Crews Installing the Digital Sign for Century Casino. Although almost any sign company is able to purchase and install Daktronics (and other manufacturer’s) digital signs, very few have been factory trained on proper installation & service techniques. Investing in training not only speeds up installation times (and reduces the price for you, the customer!) but also keeps our crews safe. Have you considered a Service & Maintenance contract? Leave all the maintenance to our experienced team, and focus on increasing profits for your business with quality content. All Digital Sign solutions are designed with the future in mind, and are fully serviceable. We want to be YOUR signage provider, so contact us for any service & maintenance your signage may require. Contact Us today for even more reasons how Blanchett Neon will help your business increase profits immediately with the most cost effective form of advertising, LED Signs.